Jackie Chan is a real master of the martial arts. Not many people can perform the stunts, have the ability to actually fight, and still showcase it in the way he does. In this video essay, Tony from Every Frame a Painting points out how Jackie Chan is able to blend action with comedy while making it look and feel as real as possible. As of now, the easiest and most lazy way to shoot an action scene is to shake the camera as much as possible when holding the camera in a tight close up of either nothing or the actor’s face. It is jarring, nothing is seen, and is unsatisfying. Not all Jackie Chan fights involve guns and actual weapons. In fact, most of his fights make use of everyday objects or whatever he can find within a scene, like refrigerators, cameras, ladders and such things. That makes it surprising and funny at the same time. It somehow grounds the action. It is a rare occasion to see Jackie Chan fight in a dark and smoky room where people are wearing black and nothing is seen. The fights are always well lit and his clothes contrast the opponent’s so that everything is really clear. Framing is something that directors often give away. The best fights are ones that show the audience the environment within which the fighting is happening clearly. Jackie Chan always makes sure everything is within the frame and nothing looks out of place. 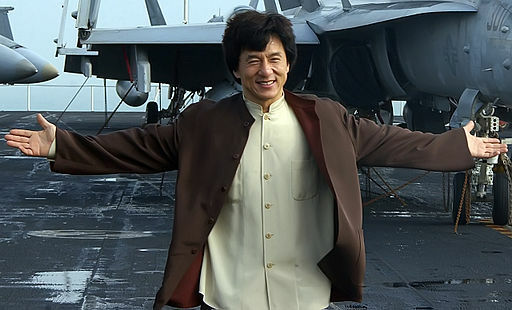 Jackie Chan, in an interview, spoke about how his American movies are filled with movement; cuts, camera angles and focus shifts are constant. His HK movies have people moving inside a still frame, not the camera moving around lazy actors. Action and reaction are kept within the same frame with minimal camera movement. All actions, reactions, and scenes have a certain music about them. That is missing in many of the movies today because directors love to cut and switch from action to reaction at every hit, at every gunshot, and at every punch. Simply holding the shot for a few more seconds allows the music in a fight pop out. While not all of Jackie Chan’s ideas can be incorporated into your action scenes, at least take your time and make sure you capture the essence of the fight, be it violence or comedy.